← A . . . Masterpiece! Julian Casablancas at the 9:30: Is This It? The New York City that birthed The Strokes, fully formed and never better than on their 2001 debut Is This It?, was as bright and prosperous as the NYC of 23 years earlier — when Strokes singer/songwriter Julian Casablancas was born there — was broke, decadent, and dangerous. Their first album managed, improbably, to conjure both Blondie-era risk and pre-9/11 ennui. It’s lately resurfaced on just about everyone’s list of the aughties’ top ten. But the 9:30 club last night, the onetime prodigy who wrote its pitch-perfect caffeinated urban hymns came off as as just another guy who wants to be . . . Thom Yorke? Deborah Harry? 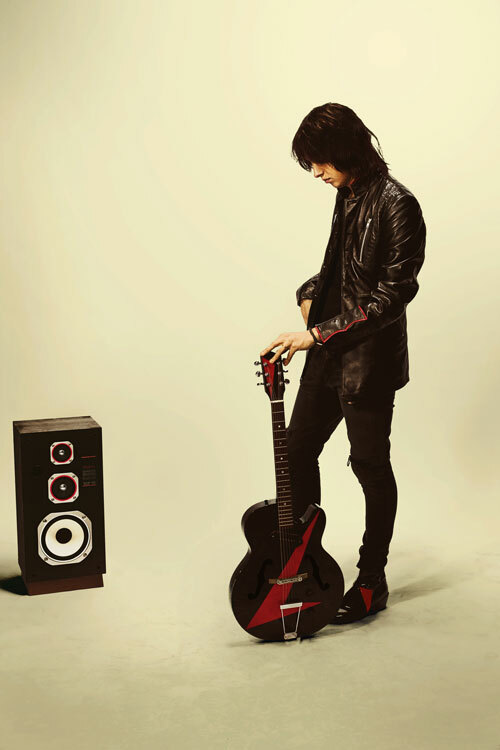 Casablancas’s two-month old solo album, Phrazes for the Young, suffers from an identity crisis, one this desultory performance did nothing to solve. The fourth Stroke to release an extracurricular set during the band’s long hibernation, Casablancas aimed for reinvention, leaving the old hits at home. Other than an encore of the Strokes curio “I’ll Try Anything Once” and an unnamed dirge he claimed he’d written backstage, there was distended pseudo-Radiohead (“River of Brakelights”) and, seriously, pseudo-Miami Sound Machine (“11th Dimension”). But only “Out of the Blue” offered any echo of the grit, or wit, of his old band. Perhaps because unemployment is way up, Casablancas brought along a six-piece, occasionally using two percussionists and two keyboard players to produce a sound as brittle and ersatz as a ringtone. (Okay, a pre-2007 ringtone.) He closed after less than an hour with “4 Chords of the Apocalypse,” the kind of awkward white gospel The Killers can occasionally, barely, pull off. You, Sir, are no Brandon Flowers, and we can’t tell you how much it hurts that that’s what you’re into now. A version of this review appears today on Click Track and in tomorrow’s Paper of Record. This entry was posted in 9:30 Club, music, shameless self-promotion, The Washington Post and tagged 9:30 Club, Click Track, Julian Casablancas, music, pop music, The Strokes, The Washington Post. Bookmark the permalink.